Kathryn Zdan plays Ada Lovelace, in Lauren Gunderson’s new work, “Ada and the Memory Engine,” at Central Works. Photo Credit: Jim Norrena. 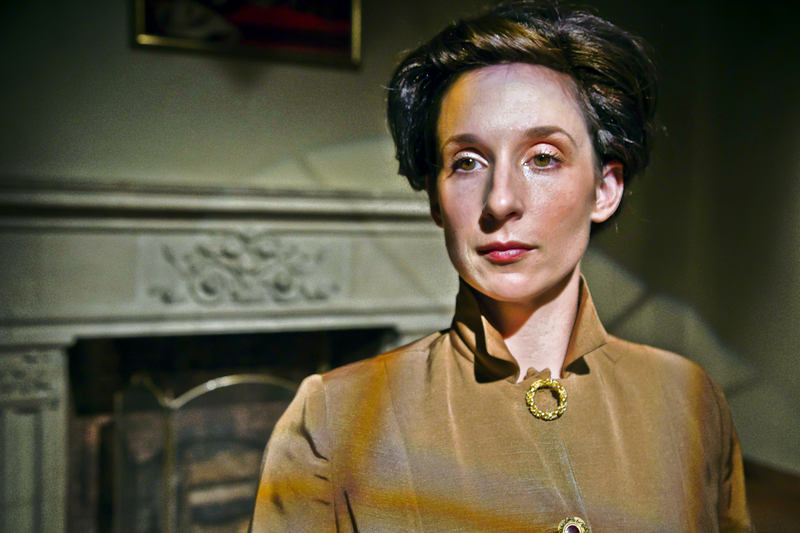 Ada Byron Lovelace (Katherine Zdan) comes to life gracefully in Lauren Gunderson’s new play about Lord Byron’s daughter, who was an avant-garde mathematical genius, and the Mother of the Algorithm. Gunderson undertakes a difficult task in showing us how a genius like Lovelace thinks and how she works out the theories and mechanics that made the modern computer a reality. Zdan brings us Ada Byron’s youthful ardor and her oppression, putting us in touch with her intelligence and her scientific-poetic discoveries. From her childhood, she is dominated by her vindictive mother, Lady Annabella Byron (a formidable Jan Zvaifler), who trains Ada in math. Byron has long ago fled England and never met his abandoned daughter, who shares so much of his sensuality and daring. As a young woman, Ada secretly reads her father’s poem, “She Walks in Beauty,” making a delicious and daring stand against her strict and possessive mother. It doesn’t help to be Byron’s legitimate daughter in that over-dressed and be-wigged world, either. The elegant and elaborate and impressive costumes tell us how heavily the restricted morality of her time weighs her down. The men in this story cannot accept young Ada Byron’s brilliance, even when they pretend to. As a young girl and incipient researcher, she becomes soul mates with a famous inventor, Charles Babbage (an intriguing Kevin Clark). The bumptious man of science has a theory for a programmable computer, an analytic machine; but he cannot come up with the math and pragmatic skills to make it happen. Clark’s depiction of the bumbling, self-defeating Babbage makes a congenial comic pairing with the innocent and oppressed Ada. Lauren Gunderson gives us some welcome comedy of manners in their struggles — both intellectual and romantic. Ada is kept practically a captive in elegant, bourgeois surroundings, by both women and men. Even women in that time side with the patriarchy to repress genius and sensuality in their own daughters. And Ada has to endure many years of struggle with a proper and conventional husband, Lord Lovelace (a striking and lordly Josh Schell), until her humanity touches him, at the fringes of their physical beings. She descends to a fate not unlike that of her heroic and sensual father, Lord Byron, “who dragged his bleeding heart across the face of Europe,” and died fighting for the liberation of Greece at age 36. His daughter faced some of the same disapproval of sexual realities, and died at age 36, as well. The fear of sexuality and the social restrictions on a woman of spirit loom large in this new play, perhaps a bit dogmatically and predictably in the first act, which goes at a stately pace, slowed, at times, by its British accent. In the second act, the drama and confrontation rise to an apotheosis in a spiritual meeting between Ada and “A Man,” reaching a notable musical climax. In a touching dream sequence, Ada meets the re-incarnation of her husband Lord Lovelace and her exiled father, returning as “A Man.” The Byronic sensuality, the union of science and love, computer thinking and poetry, are hinted at throughout the play. We could use more of this physical and literal inspiration earlier on. Here, at the end, Gunderson attempts to reconcile Ada’s brief and brilliant life with the suffering and submission she has to endure. The lights and stars of an infinite celestial array of zeroes and ones decorate their universe. We witness a subtle and graceful dance between father and daughter, husband and wife, male and female. Zdan and Schell enact a loving transcendental union with grace and elegance. The digits dance to a futuristic music, supplied by The Kilbanes, suggesting the great uses and gifts offered by the woman who brought math and poetry together. Ada, Mother of Us All, is still dancing. “Ada and the Memory Engine” by Lauren Gunderson, at Central Works, Berkeley City Club, plays at the Berkeley City Club through November 22, 2015. For further information, click here. “Ada and the Memory Engine” by Lauren Gunderson, world premiere presented by Central Works. Director: Gary Graves. Original Music: The Kilbanes. Production/Stage Manager: Vanessa Ramos. Costumes: Tammy Berlin. Lights: Gary Graves. Sound: Gregory Scharpen. Wigs: Michael Berg. Choreography: Travis Santell Rowland. Properties: Debbie Shelley. Ada Byron Lovelace: Kathryn Zdan. Annabella Byron/Mary Somerville: Jan Zvaifler.Charles Babbage: Kevin Clarke. Lord Lovelace/Man: Josh Schell. Please like us on Facebook and subscribe by clicking as indicated on the upper right corner of this page. Posted in Reviews.Tagged Ada and the Memory Engine, Ada Lovelace, Central Works, Gary Graves, Jan Zvaifler, Josh Schell, Kathryn Zdan, Kevin Clarke, Lauren Gunderson, Lord Byron, Mary Somerville, The Kilbanes.